Included below are homes for sale in Coronado Cays. If you would like more information on any of these Coronado Cays real estate listings, just click the "Request More Information" button when viewing the details of that property. We can provide you with disclosures, past sales history, dates and prices of homes recently sold nearby, and more. And, if you haven't already, be sure to register for a free account so that you can receive email alerts whenever new Coronado Cays houses come on the market. Coronado Cays is a luxury marina community made up of many inlets and peninsulas located four miles south of the Coronado Village. 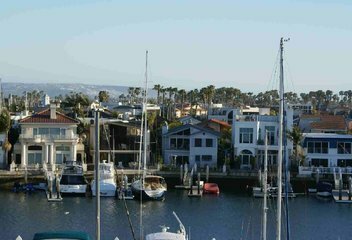 It is the only marina yachting community along the coast until you reach Newport Beach. Numerous Cays homes are waterfront with private docks and boat slips of up to one hundred feet. The Coronado Cays Yacht Club features a marina, Clubhouse, fine dining restaurant, and bar with live entertainment most Fridays throughout the year. Coronado Cays is adjacent to the Silver Strand State Beach where residents can enjoy camping, swimming, surfing, boating, water-skiing, volleyball, and picnics. If you are planning an advance Coronado Cays househunting trip the Loews Coronado Bay Resort will not disappoint with spa, water sports & bike rentals, golf, and boating from Loews Crown Isle Marina. There are ten residential villages in the Cays: Antigua Village, Bahama Village, Green Turtle, Jamaica Village, Kingston Village, Mardi Gras Village, Montego Bay Villas, Port Royale, Trinidad Village, and Blue Anchor Cay. Developed in 1973, Antigua Village is a one hundred eight unit gated waterfront condo community in the Coronado Cays. Antigua Village is located on a U-shap along Antigua Court with Smugglers Cove directly north, Discovery Lagoon along the west, and Grand Caribe Bay to the north. Floorplans in Antigua Village are two and three bedroom with large patios, private boat slips, balconies, and detached two car garages. Antigua Village residents share the clubhouse, tennis courts, and pool with Bahama Village residents. Each unit conveys with a boat slip accommodating up to a forty six foot boat with overall beam width of fourteen feet. Developed in 1974, Bahama Village is a collection of forty six waterfront townhomes and sixty five single-family-detached homes located across the Discovery Lagoon near the Coronado Cays front gate. Primary living areas are on the 2nd floor to maximize oceanfront views. Bahama Village units are located along Bahama Bend The Inlet Catspaw Cape, and Jamaica Village Road. The townhouses have large bayfront patios, two car garages and assigned boat docks. The non waterfront homes have private yards, two car garages, and partial views bay views. Private boat docks convey with most of the detached homes. The Pavilion Clubhouse and pool is located in Bahama Village however shared with Antigua residents. Blue Anchor Cay is a collection of luxury bayfront homes located on Buccaneer Way, Spinnaker Way, and Blue Anchor Cay Road. The Blue Anchor Cay waterways are Mariners Cove, Blackbeards Passage South, and Blackbeards Passage North. Most Blue Anchor Cay homes accommodate large yachts. Calypso Cay homes are Caribbean inspired with indoor outdoor living lifestyle. Coronado Cays is a luxury marina community made up of many inlets and peninsulas located four miles south of the Coronado Village. It is the only marina yachting community along the coast until you reach Newport Beach. Numerous Cays homes are waterfront with private docks and boat slips of up to one hundred feet. Adjacent to Las Palmas and La Flores, La Perla Tower was the seventh condo constructed in Coronado Shores and was completed in 1976. The La Perla neighbors Coronado Shores beach side clubhouse as well as one of the Coronado Shores Community swimming pools. Green Turtle Village is one of the largest communities in Coronado Cays with custom homes located on The Point, Admiralty Cross, Sandpiper Strand, Sixpence Way, and Green Turtle Road. The Green Turtle Village waterways are Crown Bay, Treasure Cove, Buccaneer Cove South and North, Smugglers Cove and Rendezvous Lagoon. The other similiar enclave to Green Turtle Village in the Cays is Blue Anchor Cay. Jamaica Village is a collection of two hundred fifty townhomes and single family detached homes located along the Rendezvous Lagoon on the northern end of the Cays. Some of the residences have fantastic bay and ocean views. Jamaica Village residents share equal membership of the private clubhouse, pool and direct path to Crown Cove an east-facing sandy beach on the San Diego Bay. There are forty three boat slips strung in the Rendezvous Lagoon available to lease based on availability. Kingston Village is a one hundred two unit waterfront condominium community located in the central Coronado Cays area surrounded by Inspiration Lagoon, Mariners Cove and Grand Caribe South. Kingston Village units are two to three bedroom, nice patios, and single car attached garages. Condos are situated on Kingston Court a U-shaped street. Each Kingston Village homeowner has one boat slip deeded, while the units on Kingston Court East have larger boat slips. The Kingston Village residents have access to the clubhouse and pool located in Trinidad Village. Mardi Gras Village is a townhome community of patio homes on Mardi Gras Road, Delaport Way, South Cays Court, and Tunapuna Lane. The bayfront townhomes have unobstructed views across the bay and beyond from the living room, dining room, kitchen and master bedroom. The non waterfront townhomes have partial views of ocean and bay, both have two car garages and private patios. Mardi Gras Village homes do not have docks due to the shallow water however have their own private sandy beach. The community clubhouse and pool is located in Mardi Gras Village however there is shared access with Port Royale residents. Montego Bay Villas are a three story eighty two unit waterfront gated condominium community located in Montego Village. Montego Bay Villas are located off of Montego Court adjacent to the Coronado Loew’s Bay Resort. Residents enjoy two regulation tennis courts, a solar energy heated pool, and clubhouse. Boat slips are not deeded in Montego Bay Villas however may be leased based on availability. Located on Aruba Bend, Port Royale Village is a collection of waterfront townhomes. The non waterfront detached two story homes have private yards, two car garages, and partial views of ocean and bay located on St. Christopher’s Lane, St. Kitts Way, Port Royal Road, Tobago Way and Bridgetown Bend. Port Royale Village residents have access to the clubhouse and pool located in Mardi Gras Village. Trinidad Village is a community of townhomes located on Port of Spain and detached single family homes located on Trinidad Bend. The waterfront townhomes have outdoor bayfront patios, two car garages and assigned boat docks. The non waterfront single family homes have private yards, two car garages, partial water views, and some of the detached homes include boat docks. The Pavilion clubhouse and pool is located in Trinidad Village however also open to Kingston Village residents.